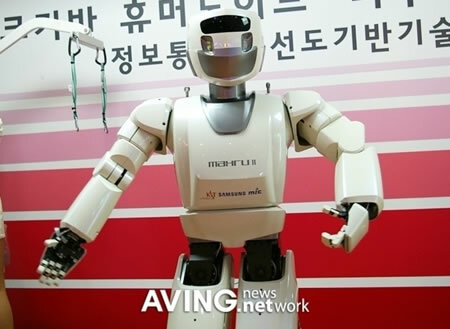 Mahru 2 humanoid robot is the result of a joint venture between Korea Institute of Science and Technology (KIST) and Samsung Electronics. An update to the Mahru 1 it is capable of voice, face, obstacle, and moving object recognition and features vision-based manipulation and distributed intelligence controlled by an external server. It can greet you in Korean style, dance, walk in all directions and follow a moving object. Compared to other robots we have seen the Mahru 2 is different as it is a network-based humanoid. It is connected to an external server and constantly sends images and voice to the server which analyses and processes the data and then sends back commands pertaining to the situation. The inventor says that by 2009 Humanoids will learn tasks themselves and share them with others. The robot has to transmit all data to a network server and back.